I rarely write first impressions of products immediately after I receive them, but I'm going to make an exception for something I've been anticipating for months. In case you missed it, last fall Baron Fig launched a Kickstarter for their own custom-designed pen, the Squire. The design is unique, and can best be described as something of a hybrid between the Ajoto Pen and the Retro 51 Tornado. The Squire uses the same great Schmidt P8126 refill as the Retro 51 Tornado (though it's branded Baron Fig). I've never used this refill in the .6mm form, as opposed to the standard .7mm, and I absolutely love it. I may need to give Retro 51 another shot, but the Squire sets a high bar. This is a brushed aluminum pen, designed with purposeful simplicity. There were two Kickstarter color options: silver and charcoal. I opted for charcoal, since I already have plenty of silver pens lying around here, and I'm glad that I chose this finish, though I'd probably categorize the color as more of a steel gray (or, dare I say it, "blue steel"), than a charcoal. As described, the pen is medium-sized and perfectly balanced in the hand, and the refill extends using a twist mechanism that functions smoothly. The only "drawback" on the design front is the branding. I would have preferred that they omit the "sword logo" and "Baron Fig" from the body of the pen, in favor of just brushed aluminum, but that's a personal preference and others might not care. The packaging I love. The bottom half of the box doubles as a desktop pen stand for the Squire. The ink flow on this refill is generous, and on the verge of being slightly too wet. If you write with a heavy hand, as I tend to, you will experience some show-through and bleed on cheaper paper. Interestingly, I was able to see the slightest bit of show-through in my Hobonichi Techo, of all things. BUT, the flip side to that is the smoothness of this refill. As a daily writer, that alone should keep me coming back to this pen, since pretty much any ink that I use bleeds through the cheap paper I have to use at work. A writing sample for the Baron Fig Squire (Schmidt P8126 .6mm capless rollerball refill). Like any liquid ink pen that writes a wet, smooth line, you're going to have slight feathering and possibly even some bleedthrough on cheaper paper. This Nock Co. Dot-Dash pad works very well. Kickstarter pricing for the Squire started at $50 shipped. Pre-order pricing on the Baron Fig website is slightly higher, at $55 plus shipping. That price might fall somewhat if the Squire takes off and Baron Fig benefits from scaled-up production, but it's the same price point as the Karas Kustoms EDK, which uses the same refill. Both pens are priced fairly for pens of their quality. 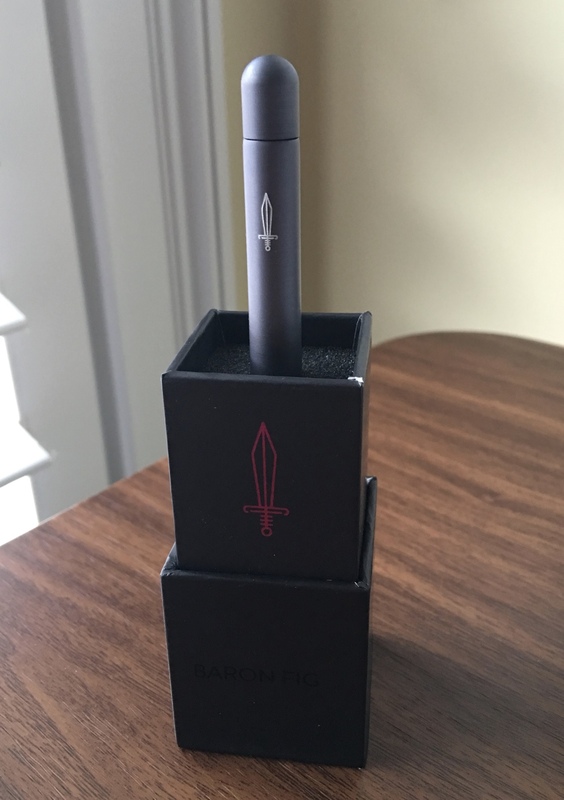 The verdict is still out on things like durability and practicality (particularly the lack of a clip and whether that will affect my personal use) but Baron Fig is onto something with the design of this pen. Most importantly, they clearly understand how to successfully deliver a high quality product on time, so I think we can look forward to new entries in the Squire line, via Kickstarter or otherwise. Personally, I'd love to see a mechanical and/or clutch pencil in this form factor. If I've piqued your interest in the Squire, check out Andy Welfle's Woodclinched blog. Andy took a sneak peek at the Squire prototypes back in November during his visit to Baron Fig HQ (jealous), and has a comprehensive review along with backstory.